data science, cyber and blockchain, and filling these positions with migrants suggests a missed opportunity to provide rewarding employment for the next generation of Australian workers. Further, our existing workforce has diversity issues: only 28% of ICT workers are women and only 12% are over 55, compared with 45% and 15% in all professional industries respectively." My colleagues at ANU are teaching artificial intelligence, data science, cyber security and blockchain. The diversity issue is one which will perhaps be addressed by changes in university programs generally, and STEM ones in particular, to include more work relevant skills. This sees computer professionals having to learn people skills, and as a byproduct makes the courses more inclusive. ps: I was last at Parliament House on 4 June to speak to the Senate Committee on the Future of Work and Workers. I suggested changes to the education system to better address changes due to technology. ... this earthquake may be capable of generating a tsunami affecting the Indian Ocean region." This was alarming because an 8.5 magnitude earthquake is extremely large. But then I noticed the location was given as "TEST_TEST_CENTRAL CHILE". This is not a real event. This event was issued due to an operator error during an internal test. ..."
It took two hours to issue the correction, which is an unacceptably long time. 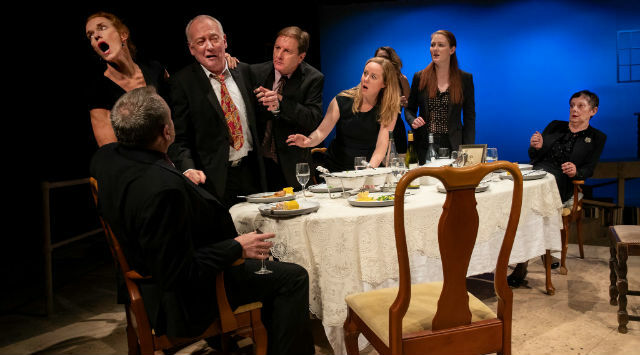 The play August: Osage County at the New Theater, Newton Sydney, last night was like many family gatherings you have been to, combined with The Big Chill. Adult children gather at the family home after many years, due to a family tragedy. They argue with each other, and their partners, over the same old things, with long buried secrets emerging. At more than three hours, with two intervals, this is a long play, but worth staying to the end. The Australian cast did a good job with mid-western US accents. Alice Livingstone had fun with the role of slightly mad matriarch. I did not understand why playwright Tracy Letts inserted a native American into the middle of this play. Emilia Stubbs Grigoriou, gave a credible performance with little dialogue to work with, but passing comment on all happening around her through expression. The set design by Sallyanne Facer was a little bare for a lived in family home. Also I found the red LED displays on the theater lighted overhead a little distracting. The Australian Strategic Policy Institute (ASPI) and Australian Computer Society (ACS) today released a national cyberwarfare deterrence policy paper (Painter, 2018). The policy advocates unilateral reciprocity for cyber-attacks on Australia. "[h]aving established a firm foundation of international law and norms, the international community must now ensure there are effective consequences for those who act contrary to this consensus." "... every country has the right to act to defend itself, but, if possible, acting together, with each country leveraging its capabilities as appropriate, is better. Collective action doesn’t require any particular organised group ...". The Australian Public Service Commission (APSC) has issued a draft learning design standard, detailing the knowledge required for government cyber security specialists. Civilian specialists working for government may well find themselves involved in offensive operations. The ANU offers a course in Cyber Offensive Security Operations as part of a Master of Cyber Security, Strategy and Risk Management. To address the ethical issues with being involved in such operations I have run students through a hypothetical on Cyberwar over the South China Sea. Deterrence in cyberspace - Spare the costs, spoil the bad state actor: Deterrence in cyberspace requires consequences, Chris Painter, Australian Strategic Policy Institute Limited, 1 June 2018.